Charles-François Daubigny began to get interested in Conflans Saint-Honorine in 1865; a painting of that subject, dated 1868, belongs to the Calouste Gulbenkian Collection in Lisbon. Another similar work from the prestigious Bessonneau d'Angers collection in Paris is dated 1873. Conflans Sainte-Honorine is situated at the confluence of the rivers Oise and Seine; the banks of the latter were a favourite subject of this artist, who tirelessly sailed up and down it on his steam boat "Le botin". This moving studio enabled him to paint from nature, a technique used in the same period by Felix Ziem in Venice, and which was later taken up also by Monet in Argenteuil, with his studio-boat. This experience enabled him to make sketches at different times of the day according to the weather and the light. The interpretation of water, whether it be that of the sea, of streams, rivers, pools, ponds or lakes, was one of the painter's favourite subjects, particularly in his representations of nature. During his wanderings, he caught the shimmering of the light, the iridescence of it on the water, and in its representation he conveyed all his emotion. 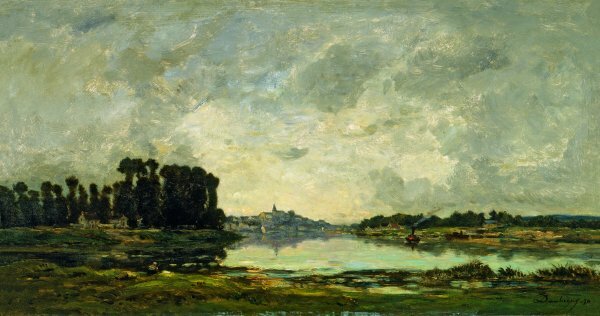 In this painting, the water from the river echoes the sky, and his use of the palette knife to apply the medium is more modern and powerful than the technique used by the impressionists, who partly diluted the forms by means of the lighting. 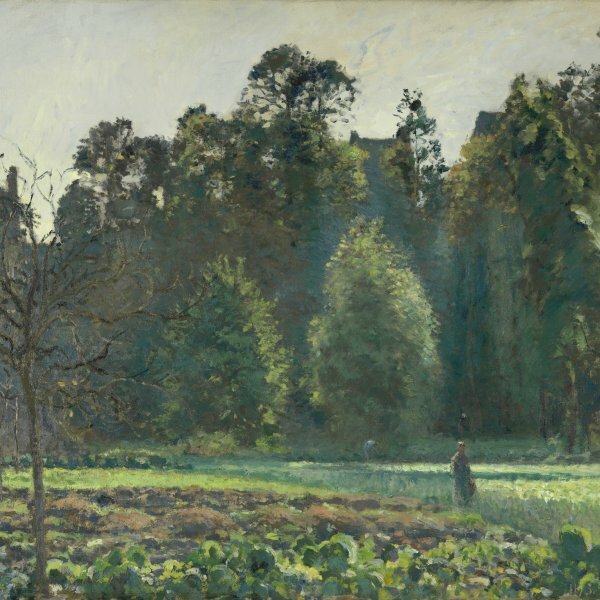 In 1873 Daubigny exhibited at the Salon a painting entitled Snow Effect in the Auvers Countryside, a work executed with the use of the palette knife. The reaction of critics was immediate: "Mr Daubigny's snow is a piece of plaster spread with a palette knife." The sky in this painting is decidedly modern, and the shades of grey, applied with wide brushstrokes, recall those later taken up by Albert Lebourg, who worked in the context to the impressionist exhibitions. The work entitled Gust of Wind, dated in 1872 and also painted on a wood panel, already marked, in its use of colour and its technique, a turning point in the artist's career, presaging the beautiful works executed on the coast, in Villerville, Dieppe, Etaples (Normandy), the views of Holland, and the banks of the Thames (England). The use of glazes on wood panel enables the artist to obtain all possible nuances, by achieving a greater transparency of light; at the same time, he can play with the colour of the wood, and make the most of its flaws. This technique was missing in the Impressionists, who abandoned this support in favour of the canvas, which offers fewer subtleties. This painting differs from the preceding work (Moonrise on the Banks of the River Oise) in its artistic technique which, going beyond Impressionism, already foretold abstraction.